I rescued a Jack Russell/Chi mix (I think). She is about two years old, She came with issues and had previous owners understood dogs they would have found a very loving wanting to please companion. Instead they just kept giving her away until she landed here. If mixes aren't welcomed I understand. Just enjoy sharing her with everyone. Comments for Are Mixes Welcome? Do you have pics of your two? Having got her from someone on CL and being passed around she could very well be but we were thinking there might be some chihuahua in there. 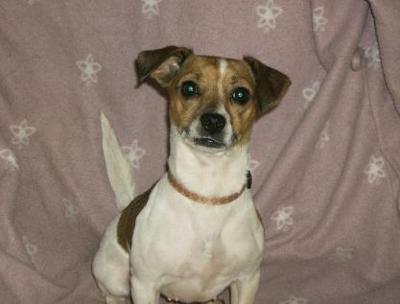 In fact the gal I got her from had her listed as a mini rat terrier. One look and I could see the JRT in her. Yes she is all the things you mention. And I love her to death even with the issues she brought with her. Welcome to the site! Yes...absolutely, mixes are welcome and your dog is gorgeous. Welcome. your dog is adorable.